Our greatest need is always to have a fresh revelation of God. When God comes to us, revealing His power and compassion, everything changes. 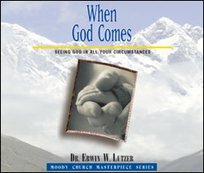 In this series of messages, Dr. Erwin Lutzer explains how our faith falters when we have an inadequate understanding of God's sovereignty and divine providence. The better we know God, the more we will trust Him and believe that His way is best.